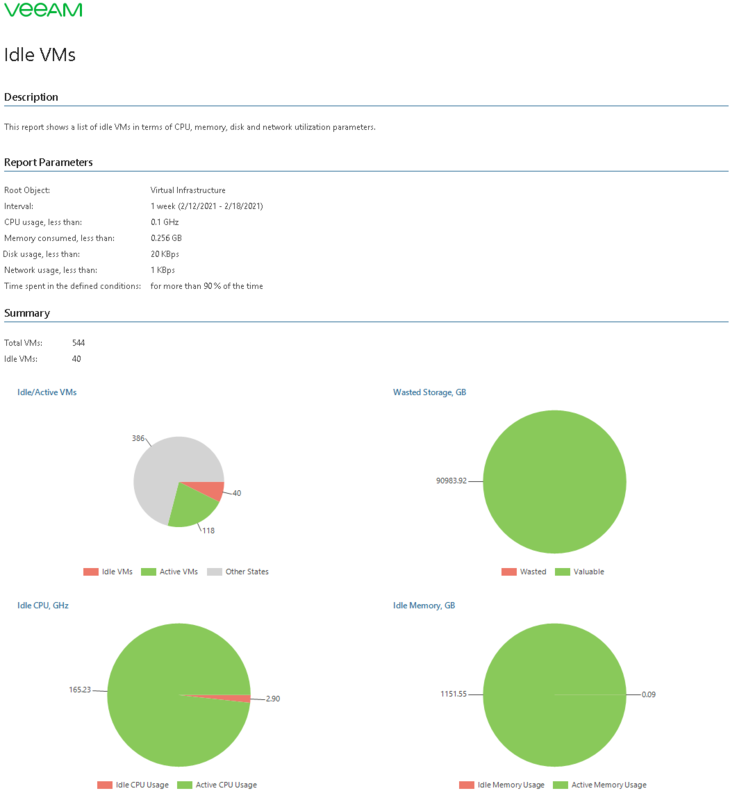 Idle VMs are virtual machines that remain running even though they are no longer used, for example the project or POC is complete — but the VMs were never decommissioned. These Idle VMs consume CPU, memory and storage resources that could be used by other active machines. This report shows a list of idle VMs in terms of CPU, memory, disk and network utilization. Idle VMs waste valuable storage resources. Use this report to review performance of your VMs and identify VMs that can be shut down or reconfigured to reclaim additional storage resources. Interval: defines the time period to analyze in the report. Note that the reporting period must include at least one data collection session for the selected scope. Otherwise, the report will contain no data. CPU usage, less than: defines CPU usage threshold. If the maximum CPU usage for a VM is below the threshold during certain number of days (defined by Time in the selected state), the VM will be considered to be “Idle”. Memory usage, less than: defines memory usage threshold. If the maximum memory usage for a VM is below the threshold during certain number of days (defined by Time in the selected state), the VM will be considered to be “Idle”. Disk usage, less than: defines disk usage threshold. If the maximum disk usage for a VM is below the threshold during certain number of days (defined by Time in the selected state), the VM will be considered to be “Idle”. Network usage, less than: defines network usage threshold. If the maximum network usage for a VM is below the threshold during certain number of days (defined by Time in the selected state), the VM will be considered to be “Idle”. Time in the selected state: defines the percentage of days in the reporting period when the maximum resource usage (CPU, Memory, Disk and Network) of the VM was below the selected thresholds. Veeam ONE Reporter checks whether the CPU usage, Memory usage, Disk usage and Network usage conditions are true at the same time (in other words, the conditions are joined by “AND”).